2Winner of the 2017 Sweetland Digital Rhetoric Collaborative Book Prize Software developers work rhetorically to make meaning through the code they write. In some ways, writing code is like any other form of communication; in others, it proves to be new, exciting, and unique. 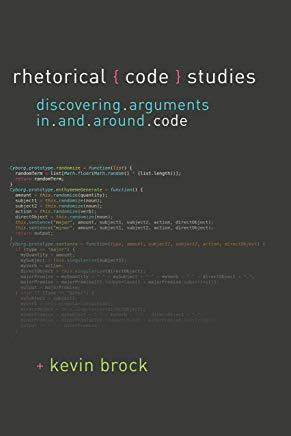 In Rhetorical Code Studies, Kevin Brock explores how software code serves as meaningful communication through which software developers construct arguments that are made up of logical procedures and express both implicit and explicit claims as to how a given program operates. Building on current scholarly work in digital rhetoric, software studies, and technical communication, Brock connects and continues ongoing conversations among rhetoricians, technical communicators, software studies scholars, and programming practitioners to demonstrate how software code and its surrounding discourse are highly rhetorical forms of communication. He considers examples ranging from large, well-known projects like Mozilla Firefox to small-scale programs like the "FizzBuzz" test common in many programming job interviews. Undertaking specific examinations of code texts as well as the contexts surrounding their composition, Brock illuminates the variety and depth of rhetorical activity taking place in and around code, from individual differences in style to changes in large-scale organizational and community norms.